Finally home in Kiev.My look of the day: new top with YSL print, which is really great and cheap and which you can find here, Zara basic shorts, mini orange bag matching with orange belt, which yo can find here, Guess black shoes and gold 'details'. Наконец дома в Киеве. Мой лук дня: классный и недорогой новый топ с принтом YSL, который вы можете найти тут, шорты Zara basic, оранжевая сумочка мини, которая сочетается с оранжевым поясом, который вы можете найти тут, черные туфли Guess и золотые "детали". I adore the Yyves Saint Laurent (hopefully I spelled that right!) look Anna, it's great you're back home, you look beautiful as usual too. Красивый образ, мне оч нравится! You look AMAZING! I ADORE your style! It is perfect realy! I think i found new fav blog. I am following you now. Follow me back if you want. What an amazing look! 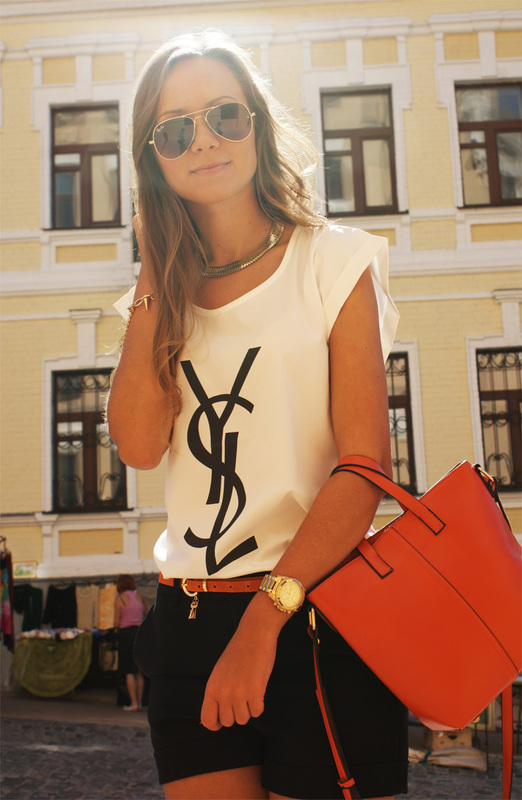 The shirt is perfect and I love the colors of the belt and bag! Nice location too! Beautifully classy look! Great style and blog :) Now following you...hope you check out my blog too! Perfect look! I love how the orange bag color pops against the other colors. And I love your shoes! Может, тебе понравится мой свеженький молодой блог)) спасибо за внимание! Thank you for your comment and your follow..yes let's follow on bloglovin too! I'm #199! I'm waiting for you too! great, but where are you? Yes, yes, that's great :). You know a little bit into Polish? Wauw love your blog too! I really looks great and love the pictures! your blog is breath of fresh air....love it! I really like your pictures and this iutfit is great! You are fantastic! I love this outfit, it's perfect! Thank you for the lovely comment. I was pleased that you liked my blog. Now I will follow with great pleasure on GFC and bloglovin if you like returns! I hope I'll be in touch, you are a good fashion blogger! You look so pretty! !Great blog. What about following each other? WOw I love this tee!!! I want it!!! You are so pretty.Love your shirt ! great casual look, love the purse! thanks for visiting my blog, i like your style too. i'm following you now! Very stylish look, great t-shirt! such a cute outfit I love it! The belt is awesome! You look gorgeous! Such a lovely look & amazing blog. Thanks for your comment, I'm following you now via Bloglovin & GFC! Thanks for your comment, of course we can follow eachother! I follow you right now, please make sure you follow back. Hello beautiful, your blog is really nice and inspiring, would you like to follow each other, i just followed you...keep in touch !! I hope you will follow back as promised! You look amazing, I love your t-shirt! Can we follow each other.Come and check my blog if you want.